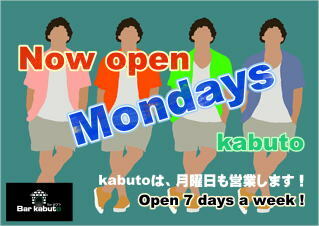 ＊Bar kabuto is for gay mens only bar except Monday and Tuesday which you may accompany any straight friends. We welcome all gay men from all over the world! 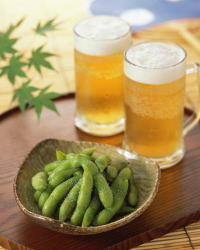 Bar kabuto is located in Kamata, Tokyo, close to Japan & Tokyo's entrance, Haneda International Airport. 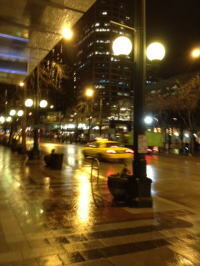 It is gay men only bar and the only English spoken gay bar in this area. Friendly neighberhoods bar, that also welcomes all nationalities who want to meet locals and experience Japan's local atmosphere. Most of the time, English speaking staff is available. Enjoy local atmosphere with friendly locals and karaoke! Bar kabuto's charge system is typical Japanese gay bar style. Please enjoy our reasonable price range compare to Shinjyuku Metro areas. Japanese gay bars' convenient system allows you to keep your liquor bottle(700ml~) at kabuto if you would like to be a frequent visiter. kabuto's variety drink menu includes draft beers, shochu, wines, champagnes, whiskeys, sakes, and other spirits and cocktails. 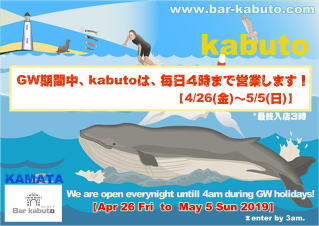 Bar kabuto is located at just 3min. away from JR Kamata station. You may get to Kamata conveniently from the Tokyo metropolitan area and Yokohama areas. There are 3 train staions in Kamata. While JR Kamata stn and Tokyu Kamata stn is connected, Keikyu Kamata is about 6min. away from JR Kamata. go straight to the alley between cigaretts shop and Tonkatsu Restaurant(Katsuya). Keep going until you pass two streets, you should find a light-brown color bldg. on left hand side within 1 min. Kabuto is located on the 4th floor at this bldg. Please use stairs to the 4F. 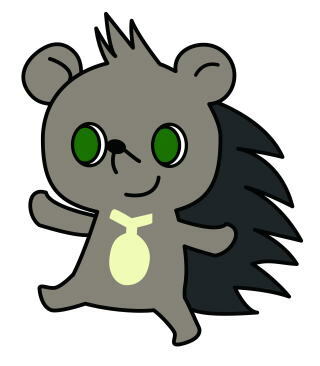 Our hours may vary during Japanese holiday seasons such as Golden weeks(May), or New years(Jan). Please contact us before making a plan during the holiday seasons. copyright©2012 Bar Kabuto all rights reserved.